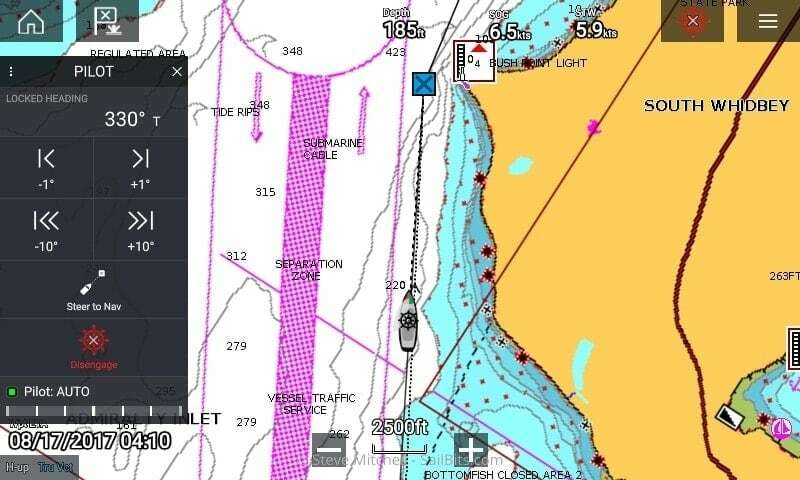 Raymarine released Lighthouse 3.1 in July 2017 with a number of new improvements and fixes. I installed it a few days after it was released, and tested it out on several small trips on Grace, as well as a 2 week long tour of the San Juan Islands. I found a number of really nice things that were added, specifically around the auto pilot integration, and some work left to do. 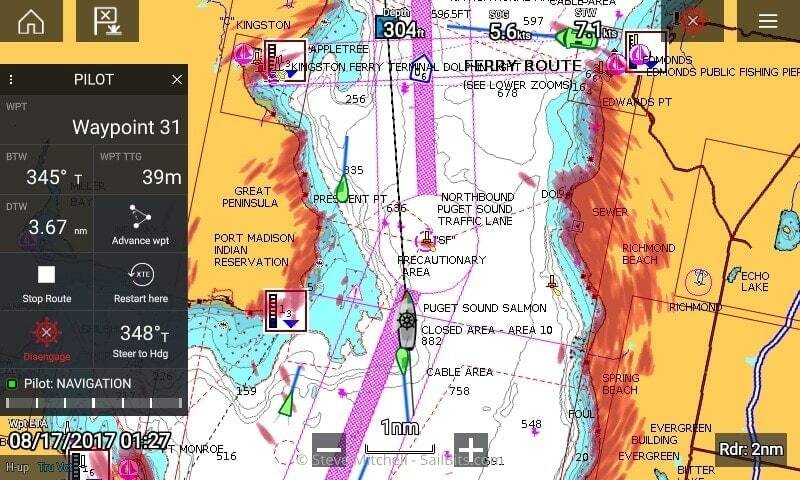 Make sure to check out my review of the Raymarine Axiom chart plotter and Lighthouse 3.0 for more in depth pictures on Lighthouse and the initial release, as well as an update on Lighthouse 3.2 with Navionics and Fusion audio support and an update on Lighthouse 3.3 with AIS and radar, and the latest on v3.4 with apps like Netflix, Spotify, bluetooth support and more. The two biggest feature updates in 3.1 are Evolution Autopilot support, and sonar enhancements. Since I do not have a sonar transducer, I won’t be covering those updates, although from the videos and feature overviews, they look pretty cool. Instead, I will be focusing on the auto pilot changes. Setup of the autopilot is in the main Settings area and allows for the same or similar settings as in the Evolution p70s head unit, but far easier to see in one place. 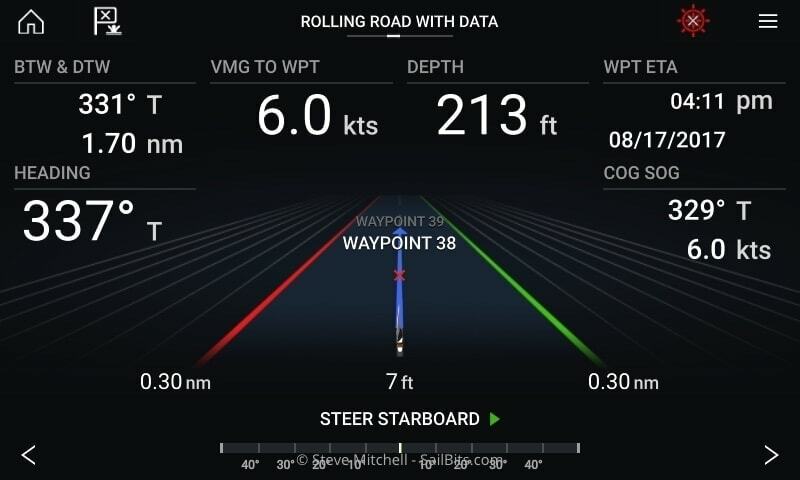 The graphical representation of Leisure, Cruising, and Racing mode (sailboat settings of course) are quite nice, along with a description of what each means. There seem to be more options for things that I don’t remember from Lighthouse 2.x, but they could have been buried deeper in places I never needed to use. I am intrigued by the debug level settings for the CCU and ACU – perhaps that is for troubleshooting by Raymarine? I completely re-ran the Dockside Wizard as well as customized the settings afterwards. Once that was done, I was ready to get out on the water and try things out! Once things are configured, you’ll notice a ships wheel icon in the upper right of the charts display. In addition, on the left hand side, there is a new pane of information titled “PILOT”. This pane can be swiped left to hide when not in use, click the X in the upper right of the pane, or you can click the wheel icon to show/hide it as well. 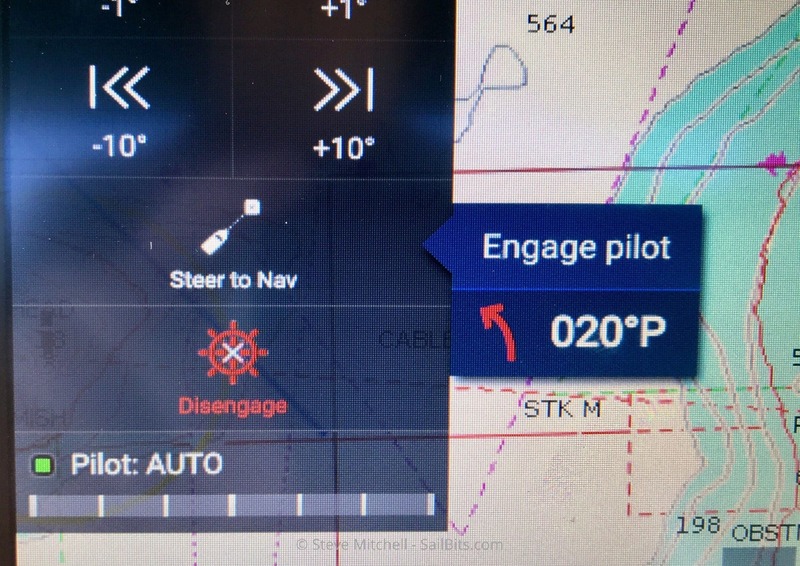 The ships wheel turns red when the autopilot is engaged. 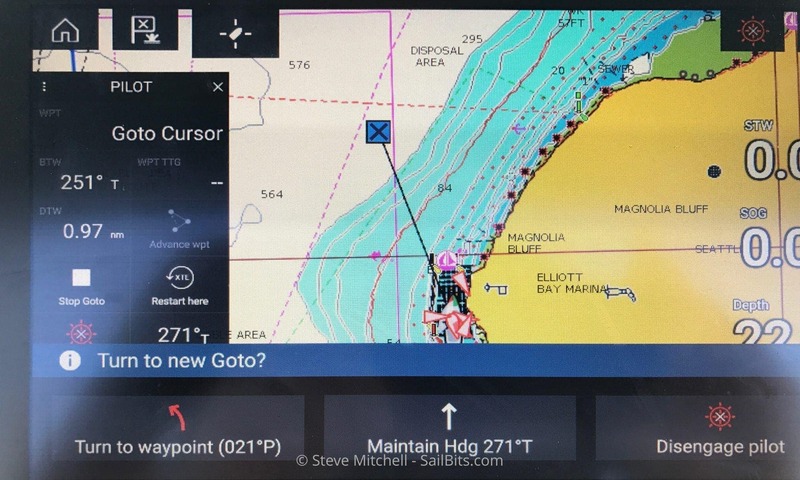 The individual squares within the pane allow you to command the autopilot to do something – in this case, you can steer to a compass heading of 189 true, or to a navigation waypoint. You can also see the state of the autopilot (STANDBY) and the usual bar showing autopilot “effort”. The most common way I use the autopilot is to use a route or set of waypoints. In the screen shot above, you can see me navigating along a route, specifically to Waypoint 31. 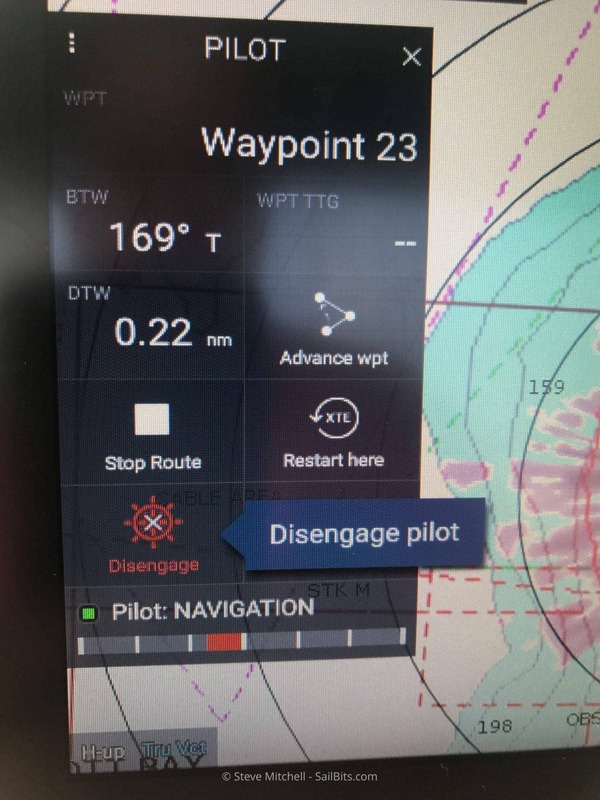 When you’re in Steer to Nav mode, the autopilot pane changes and shows a ton more useful information – your Bearing To Waypoint (BTW), time to Waypoint (WPTTTG) and Distance to Waypoint (DTW). In addition, you can make some quick changes – Advance to the next waypoint, stop the route, restart your XTE from the current location, disengage the autopilot completely, or steer to a compass heading instead of following Waypoints. Keeping with the theme of my Raymarine Axiom and Lighthouse 3 first impressionspost, usability is clearly something Raymarine is thinking about with these feature changes. While you can do most of them from the p70s autopilot controller, none are as quick and easy as the screen above, and not displayed as well. I absolutely love being able to restart my XTE – another great shortcut on the panel – from wherever I am if I happen to dodge something, taking the autopilot off of waypoint/track mode, and then back to waypoint mode. In the past, this meant a crazy turn the moment you restarted track mode, and some stupid choices by the autopilot to try to get back to the artificial track course and within XTE limits. Restart XTE from here solves that elegantly by simply adjusting it as if you never off XTE. Being able to advance to the next waypoint is also very convenient and easy to select. I’ve already used it several times when I have to dodge something, and the next waypoint makes more sense to follow from that point onwards. One of the best parts about the new integration is the information and control you have at your fingertips in such a small area, and one you can show or hide very easily. 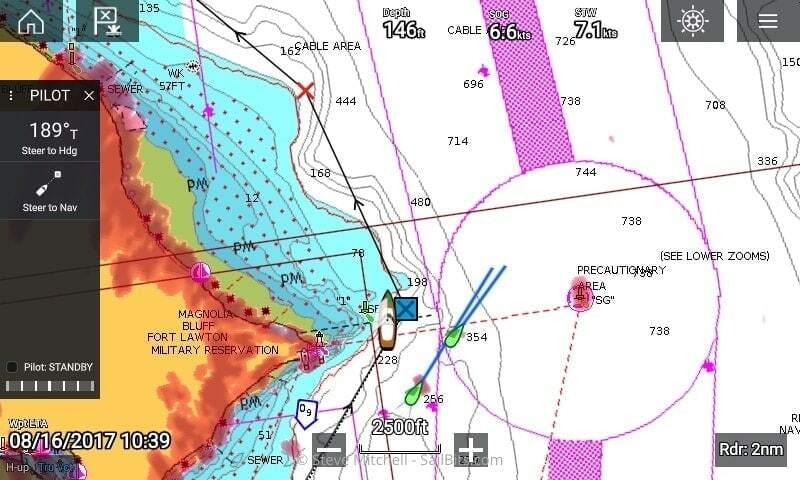 Being able to see how much longer you have to the next waypoint, quickly switching modes, and all of the other data really shows how much Raymarine is thinking about how we use their products, not just ensuring that the basic features are there, but burying the functionality 5 clicks deep. 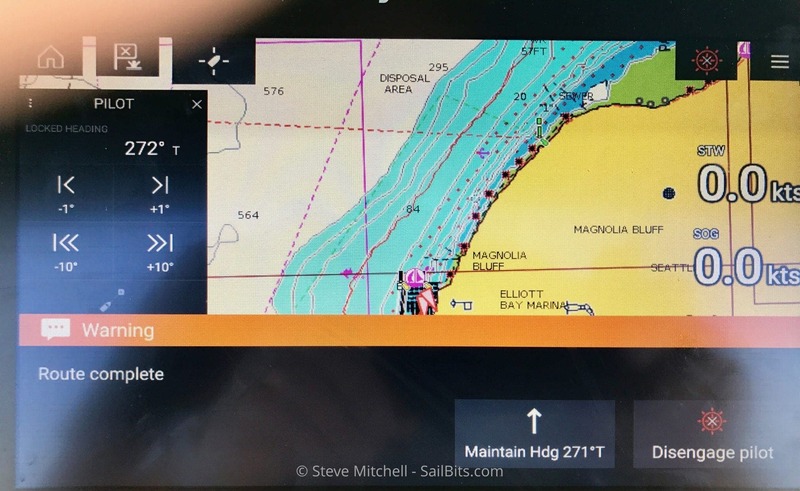 As easy as iPads are to use with apps like Navionics, it is great to see a main-line manufacturer realize they have the same opportunities to make what we do easier. Quickly changing to “Steer to Hdg” is usually the way I dodge something. 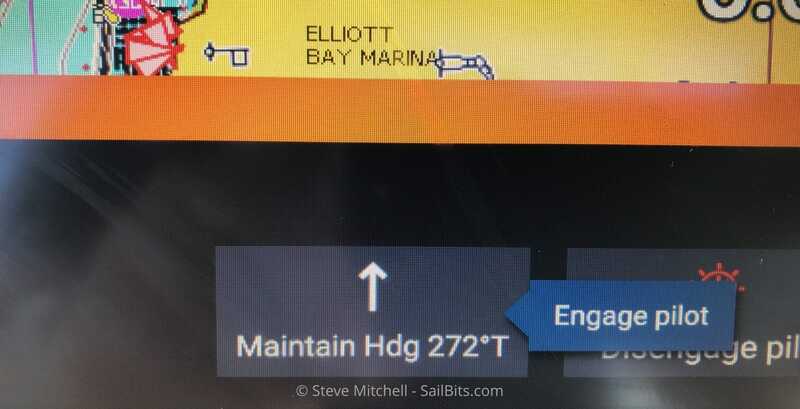 Once you enter that mode, you are given the heading you’re on, plus the usual 1 and 10 degree course change controls, as well as a way to flip back to steering to navigation points. Very nice to have those controls directly on the screen. In Lighthouse 2.x you could make course changes, but only in 1 degree increments, and even then there was a significant lag that always made me search for the p70s head instead. Capturing a screen shot of one of the other nice features is impossible with the built in screen capture functionality. Instead, I’ve had to snap photos with a camera which results in slightly worse images. In the picture above, I have clicked “Disengage” and a popup has appeared titled “Disengage pilot”. Clicking on that confirmation disengages the autopilot, and you’re done. In the past, there were multiple other OK boxes you would have to dismiss, and especially with Lighthouse 2 and the p70s, beeping and boxes on both of them that routinely got out of sync, requiring you to dismiss both of them. The popups are used in many situations. It seems to have cut down on the number of clicks or button pushes that I had to do in Lighthouse 2 with both the p70s autopilot head and the chart plotter. 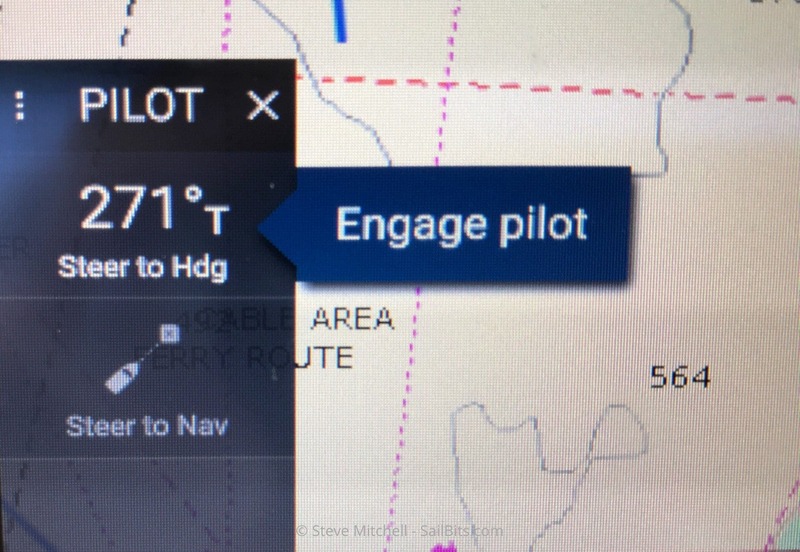 When engaging the autopilot in Navigtation mode, you’ll get a popup to confirm along with a handy display of which way and how much the boat will turn. In the example above we’re turning to port 20 degrees. Another nice usability touch. There are a number of other enhancements with multiple choice options that are far more clear than they used to be. Above you can see I can choose to turn to port to a waypoint, maintain my heading, or disengage the autopilot altogether. Nice big boxes at the bottom of the Axiom screen, and when you click one, you get one of the popups confirming that you want to continue, so there’s no accidental clicks. When you’ve completed a route, you’re given choices as well – here we can maintain our current heading or disengage the autopilot. In previous versions, you had to acknowledge the route was complete, but the autopilot simply went into heading mode at that point unless you manually put it in standby. And if you choose to maintain your heading, you have to accept a popup just like everywhere else. Now that the autopilot is working on my Axiom, I can also use some of the dashboards more effectively. Above you see the rolling road while I am navigating to a waypoint. It shows a lot of the same data as on the pilot data box when you’re in chart mode, plus a bit more. I prefer the chart view myself, but this is useful if you happen to be driving manually or just need more info on one big display. 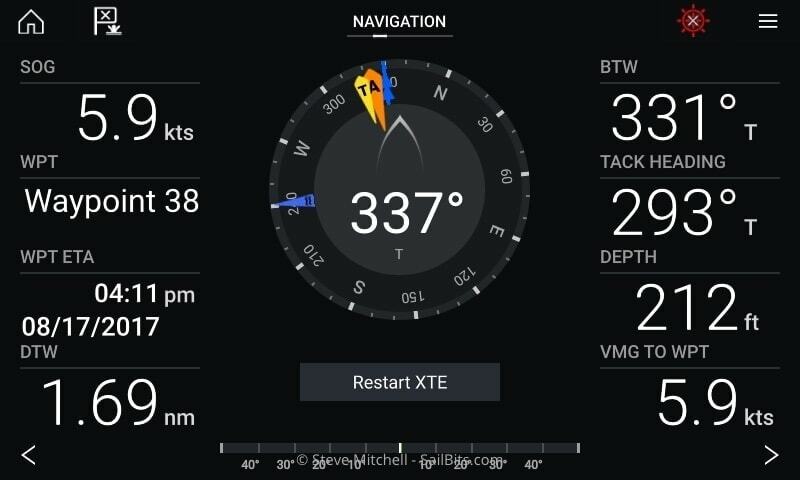 I have used the Navigation dashboard a bit more than the rolling road, mainly because it adds the true and apparent wind to a nice compass, and allows you to reset the XTE if you need to. 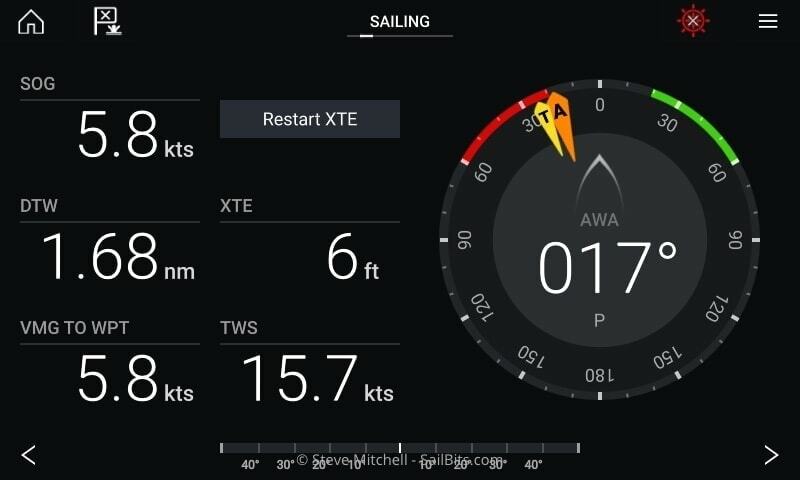 The sailing dashboard is the least useful to me right now – I know that Raymarine has said in late 2017/early 2018 that they will be releasing some sailing functionality in Lighthouse 3, and it can’t come soon enough. I still have a B&G Vulcan 5 that I keep specifically because of the SailSteer features and other sailing related niceties. Usability & Integration – popups, multiple choices, and lots more thought into how someone uses the autopilot features. It also feels like the whole autopilot system is integrated together, and that you could use either the chart plotter or autopilot head interchangeably. In the past, it felt glued together. Quickly reset XTE – very convenient when dodging or falling off of a route on purpose, you can quickly reset XTE and not do stupid turns. Switch between modes – again if you have to dodge something, switching to heading mode quickly, and then back to waypoints is much faster. Data – having useful bits of data overlaid on the control such as distance & ETA is nice. Before you had to add those as manual data boxes that took up room on the chart screen. I’m not sure if I missed this in my Lighthouse 3.0 review, but it is definitely something to be aware of. If you click and hold on your boat icon, a menu comes up that allows you to customize a bunch of things that used to be elsewhere in Lighthouse. I am glad to see them here, as I have thought the boat icon by default is way too large. You can customize your boat offset on the map, the symbol size for your boat (I like teardrop as it’s much smaller) and the vector length for any vectors you have turned on. You can also turn on things like heading, COG, range rings, etc. but I have yet to see some of them work. Tide and wind don’t seem to show anything at all, while COG and Heading work intermittently. Range rings is the only one I have seen work reliably, as it’s just drawing rings on the map. While the integration with the autopilot looks solid and has some great features, there are still some gaps and issues with 3.1 that I experienced. 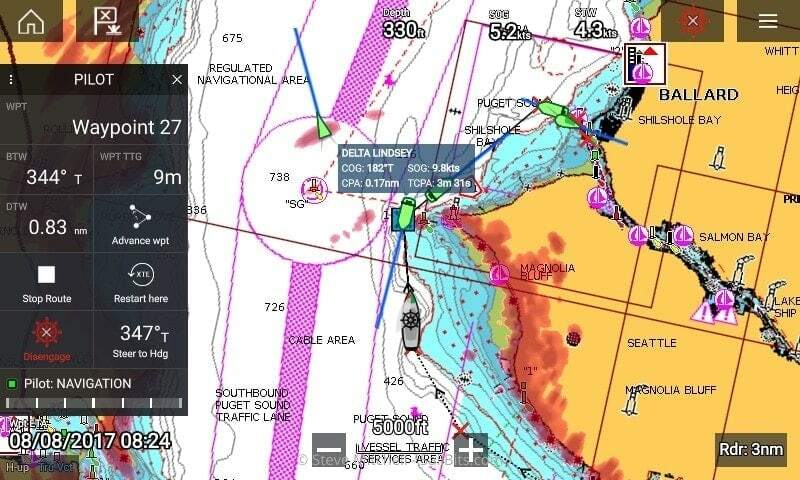 AIS Features Missing – one of my absolute favorite parts of Lighthouse 2 was the improvements Raymarine made in R15 to the way AIS data was displayed (you can see examples of this in my post here – scroll down a bit). I sail in a very congested area with multiple ferry routes, container ships, cruise ships, and a multitude of other things moving around. Having the CPA displayed with min and max areas, plus more, was a huge improvement that no one else as far as I know has duplicated. This was lost in the transition to LH 3 and really needs to come back soon. I have not seen much of an ETA on this one. Radar Disconnects – this is probably the most concerning of all. I have a Quantum radar that is connected via WiFi to the chart plotter. With my es78 Raymarine unit, it was rock solid, and I used it for almost a year without any problems. With the 9″ Axiom, it disconnects every single time I use it. Sometimes it will stay connected for an hour, other times 2, but it always eventually disconnects. Raymarine has responded to a forum post I have made on this, but there is no resolution as of yet. The only difference in the install is the chart plotter – the Axiom is in the same place as the es78 was, literally underneath the radome, and is using the same power, same network, etc. What makes it scary is that there is no warning – no alarm goes off, nothing pops up on any screen, the radar is just no longer connected. Lighthouse 3.1 is definitely a great improvement over 3.0, which to me was a good start, but really was more of beta software when it comes to the amount of features they had versus their previous products. Raymarine has a long road ahead of them to get back to feature parity with that version, but if they continue with the usability improvements, I am willing to wait – at least a little bit longer. Have you used Lighthouse 3 or 3.1? Let me know in the comments! One of the most hated bits of the boat is the head. Every boat I have owned has had a unique set of steps required to make sure things “work out” for everyone involved. I replaced the head with a Raritan SeaEra electric model. The crew absolutely loves it, and considers it the best upgrade. Attaching things to random places on the boat seems like a common occurrence, and sometimes hard to do. I stumbled across Fix Clips and I don’t need anything else.